Troy Whitman is part of SCE's Fire Management team and is currently monitoring the San Gabriel Complex Fire. The San Gabriel Valley Complex Fire has so far burned 5,000 acres. SCE’s Fire Management team is coordinating with first responders as the San Gabriel Complex Fire continues to burn. As Troy Whitman drove up San Gabriel Canyon, the devastation from the still-burning San Gabriel Complex Fire was all too vivid. Amid the scorched terrain he noted at least 10 damaged power poles. 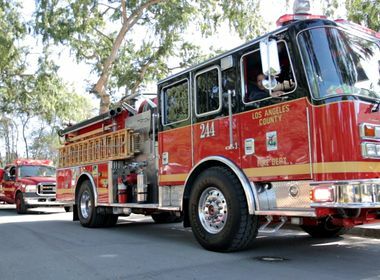 This is Whitman’s 23rd year managing fire events for Southern California Edison. And at least six of those fires have been in San Gabriel Canyon. He knows this repair will be extensive. The 40-foot poles will need to be taken up a steep canyon and new poles will need to be brought in by helicopters. “It will be weeks before we can restore power in this area,” according to current projections, he said, noting that there are currently about 100 customers without electricity in the fire area, which includes the remote canyon communities of Morris Dam and East Fork. And SCE will continue to update customers on restoration efforts. The San Gabriel Complex Fire, formerly called the Fish and Reservoir fires, started on Monday and quickly engulfed the cities of Duarte, Azusa and Monrovia. On Thursday morning, an SCE helicopter was given the OK from fire personnel to enter the restricted area to survey the damage to transmission lines. 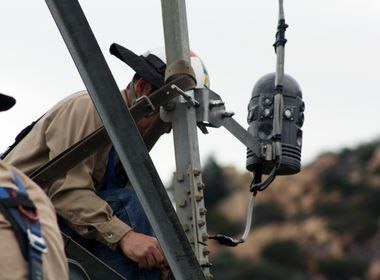 Part of the repairs will involve removing fire retardant that has accumulated on the transmission towers’ insulators. This will involve linemen climbing up the steel towers and physically removing the sticky residue from the components. But before SCE personnel can enter the area, the fire department will need to determine that it’s safe. Crews are currently awaiting their OK before they can restore power to the affected residents. So far, 5,000 acres have been scorched in the San Gabriel Complex Fire. The fires were at 15 percent containment Wednesday night and some residents were allowed to return home Wednesday afternoon. About 300 customers were without power Tuesday because of the fires and SCE worked to restore power to 200 customers. About 100 customers remain without electricity. As part of this fire’s Incident Command, Whitman is currently stationed at the Complex Fire’s incident command center and has been sleeping when he can, usually in his truck. 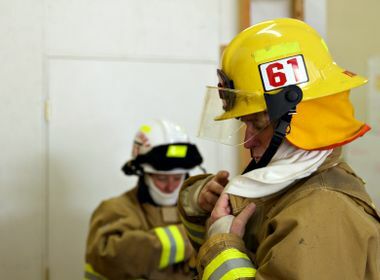 He describes his role as the first point of contact for the fire responders. He helps keep SCE personnel informed of fire details, assesses damages and determines when it is safe to go in and start restoring power. He gives all the credit to the first responders — fire and police personnel. He also credits SCE’s troublemen. “The true first responders for SCE are our senior patrolmen and troublemen,” he said. With strong northeast winds expected Thursday night, Whitman’s got a long night ahead of him. One concern is that the winds will drive the fire back closer to homes. “When the threat to our lines has subsided and we can get our personnel safety in there, then it will be time to go home,” he said.